Two Moms. Two cultures. Lots of Laughs. Join Us! 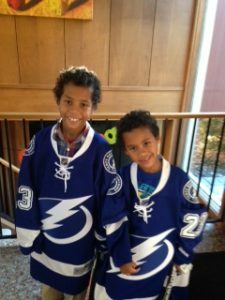 Search results: "A thank you letter to J.T"
I’ve never met you personally, but I wish to thank you for sharing your love of hockey with our underrepresented youth. I know you’re a professional with Tampa now, but I watched your career grow through my child’s eyes. I first heard your name when my three year old son shouted it and praised you as you helped usher our (Duluth’s) UMD Bulldogs to the NCAA Championship title in 2011. You have no idea how much you have inspired my son. He would study you. He would watch you skate, watch you stick handle around defenders, watch you score, and he would see himself in you. You see J.T, my child can identify with you like very few can. He too is a biracial child who loves to play hockey. He also lives in a community much like yours when you were young. He’s not surprised that he’s the ‘only’ [biracial] kid rink ratting with his friends. Like most hockey moms, I’m out there watching him at games and practices. But unlike most hockey moms, I’m the ‘only’ [person of color] and with that comes ‘those’ comments from other parents in the stands. I keep my head up and am so proud to see my son play the game. I will continue to bring both of my boys to countless hockey practices and to countless games, simply because they love the sport so much. I just wanted you to know that you are still inspiring little African American boys in Duluth that would love to ‘rink rat’ with you someday. 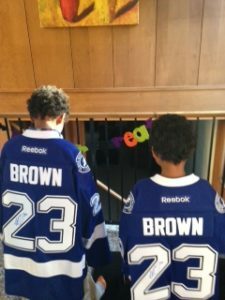 This past February I posted a Thank You letter to the Tampa Bay Lightning’s right winger J.T Brown. Much to my surprise, my post went viral. Mr. Brown himself even reached out to our family. He sent a very heartfelt and inspiring letter to my sons. His words of courage and understanding in the sport of hockey will continue to guide my children. In Liberia we say, “Sharing your blessings with others will come back to you and the generations after you.” J.T Brown, your generosity to our family will bless your family for generations to come. You’ve made this Liberian Hockey mom proud beyond measure!